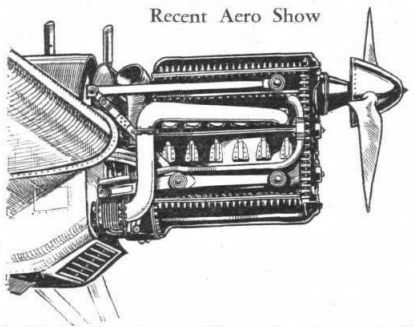 Arrangement of the air-driven electric generator in the Fiat CR 32 single-seater fighter. 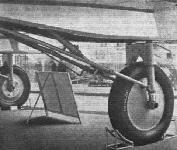 Engine nacelle and retractile undercarriage of the Potez 540 bomber. 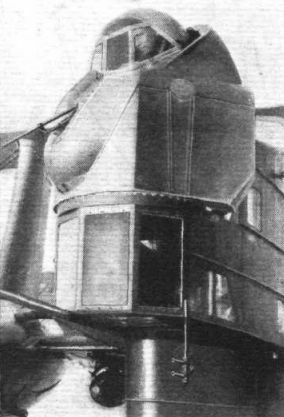 Note the nose gun turret. 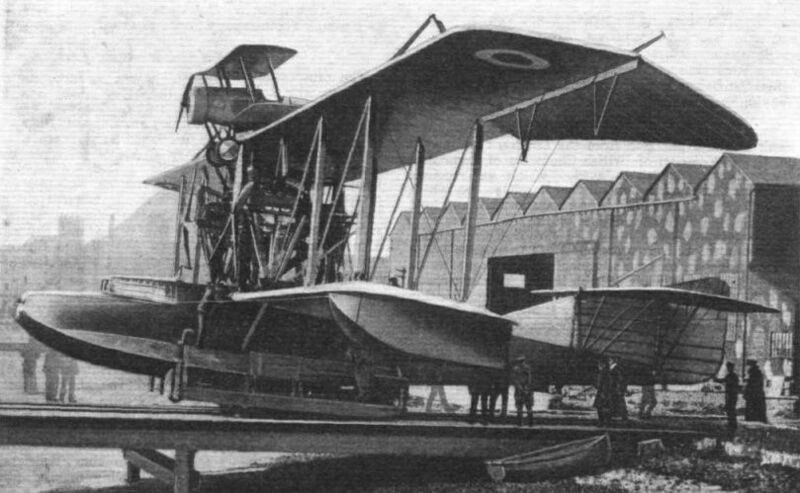 ANTECEDENT: In our recent description of the Short-Mayo "composite aeroplane" scheme we referred to a War-time experiment on the same lines, carried out at Felixstowe. 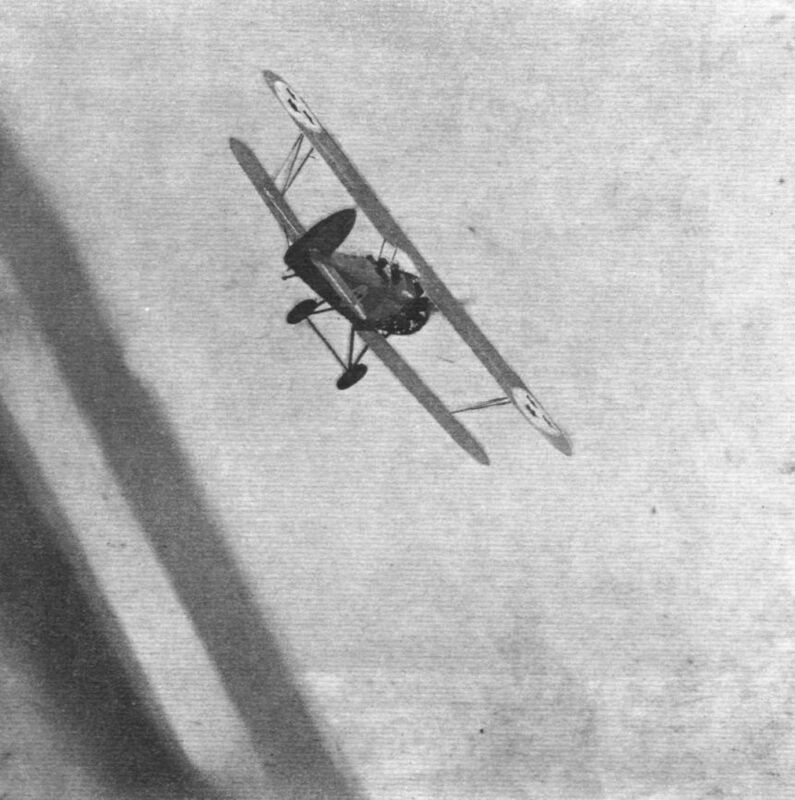 This photograph, reproduced from The Wing (journal of the Felixstowe R.A.F. 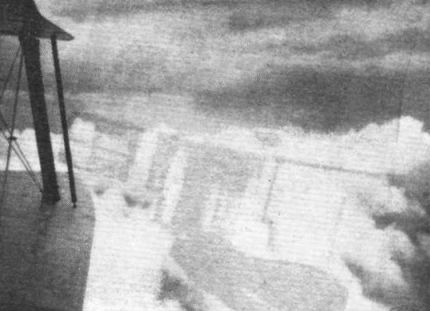 Station) of November, 1918, shows the machines concerned; the parent aircraft was the original Porte "Baby" flying boat and it carried a Bristol "Bullet." 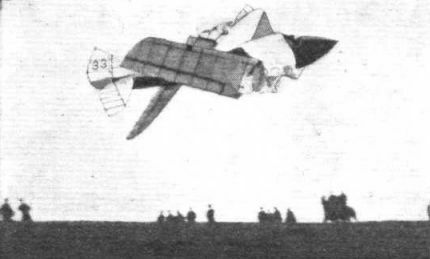 The late Lt.-Col. Porte (in white muffler) is seen walking under the tail plane; the pilot of the "Bullet" was the late Fit. Lt. Day. The copy of The Wing from which this was taken was kindly sent by Mr. Charles A. Rippon, who is Hon. Chairman of the Northern Heights M.F.C. and a member of the Felixstowe Old Comrades Association. 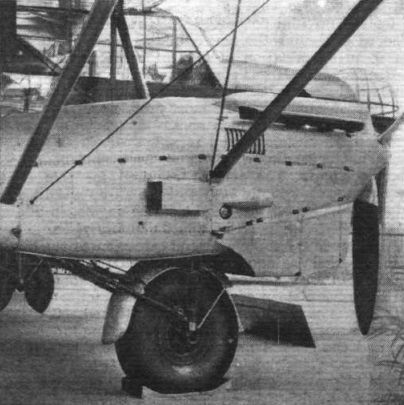 FOR HIGH ALTITUDES: The Hawker "Hart" fitted with the fully supercharged 9-cyl. Bristol "Pegasus" IV, rated at 660 h.p. at 11,500 ft.
ONE GOOD TURN... A "Hart," with the chief photographer of "Flight" as passenger, keeps hard on the tail of a similar machine with "Pegasus" engine, built for Sweden and flown by Fit. Lt. P. W. S. Bulman. 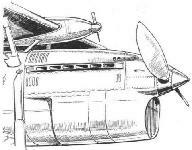 IN "APPROACH" POSITION: The split flaps on the "Hawk Major"; notice how the central flap opens in the reverse direction. Messier retractile undercarriage on the big Bloch 211. 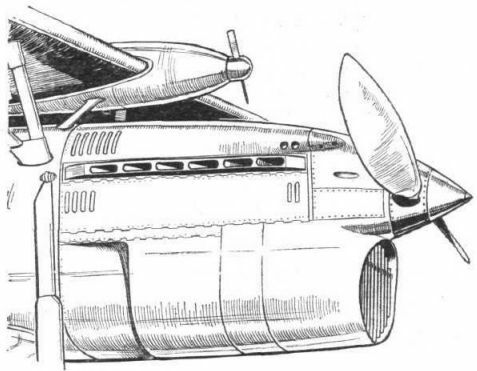 NOTEWORTHY: A three-quarter front view of the "Shark," which shows clearly the strut bracing of the wings. 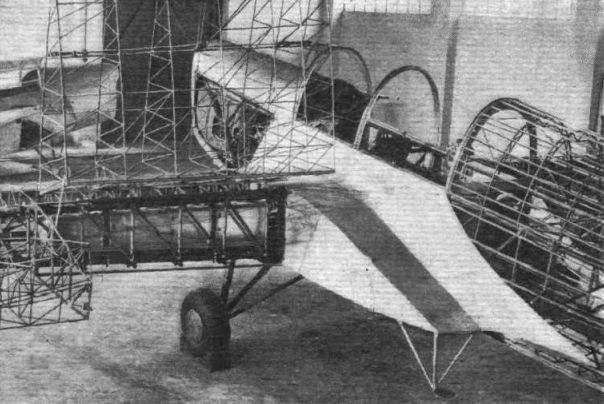 The rear portion of the fuselage without its outer plating. Fuselage construction at the tail. 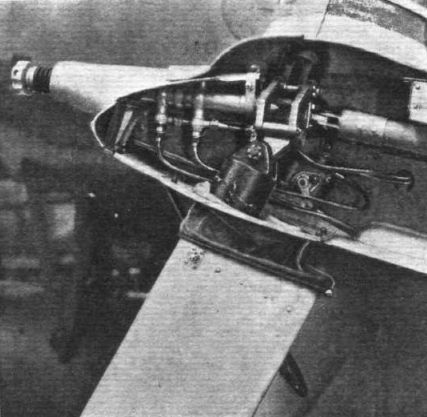 A close-up of the bottom front spar fitting, showing the hydraulically operated pin. 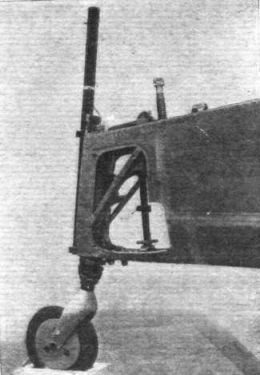 The lever is half hidden behind the undercarriage leg. 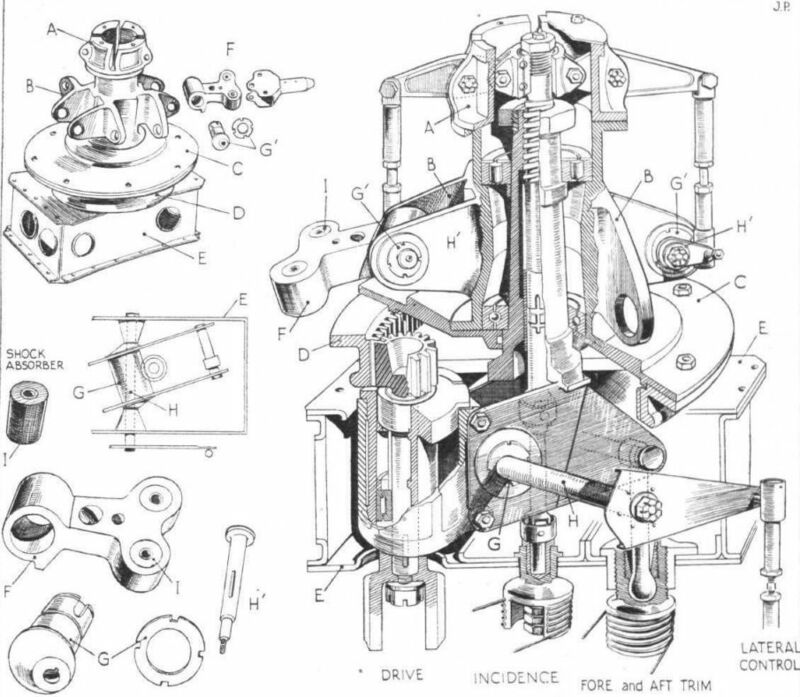 The root end of a lower outer plane. 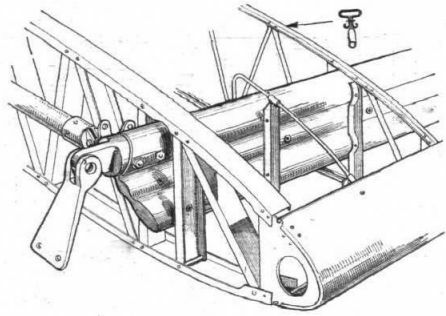 The spar is one of Boulton Paul's drawn sections of wrap-jointed steel tube. A bottom wing centre-section. 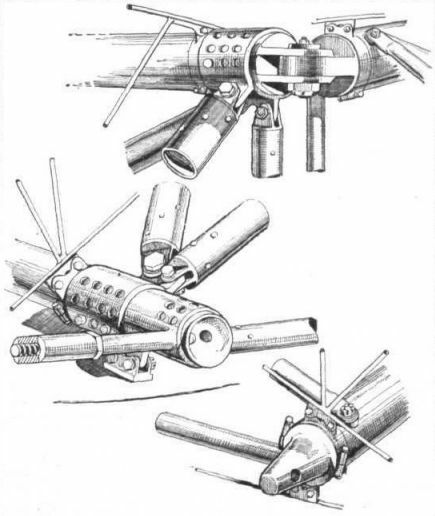 On the right is the rear spar fitting, which is also a catapult connection. 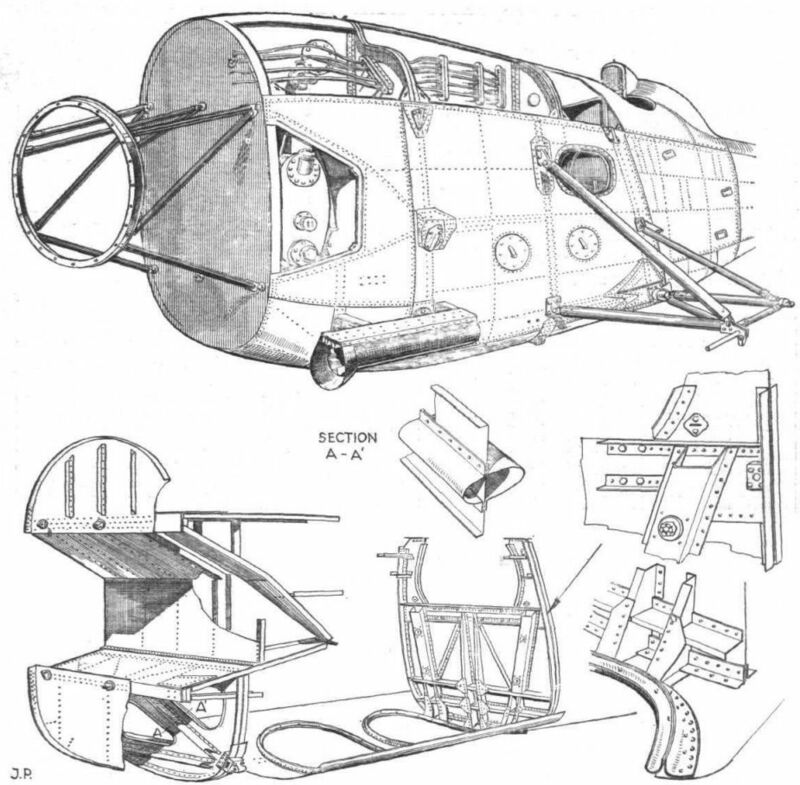 These drawings show the monocoque construction of the centre and front portions of the fuselage. At the bottom, on the left, are the manholes through which the fuel tanks are offered up into the fuselage; the holes are then closed with water-tight doors. RECEPTION: When the K.L.M. 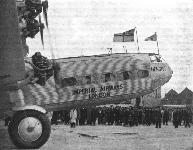 "Douglas" returned to Schipol aerodrome, Amsterdam, after the Melbourne Race, 80,000 people were present to see the famous machine and its crew. The line of mounted police in the background adds a picturesque touch. A SPORTS MODEL: The fascinating little Italian Magni "Vale" single-seater, with 130 h.p. Farina engine, which attracted much attention at the recent Paris Show, owing to its beautiful finish and businesslike appearance. A castor nose wheel allows the fullest use to be made of the wheel brakes of the Hammond Model Y. This photograph is of a model. "OR" ready to leave Baghdad. Taken while refuelling at Rutbah. 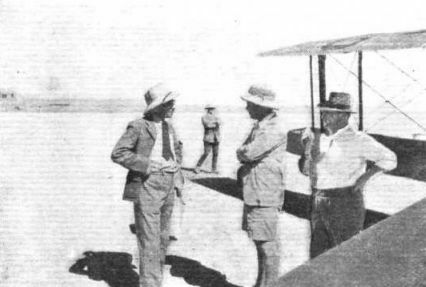 Left to right are Mr. Jerry Nairn, of Nairn Transport, Mr. Graham Mackinnon (owner of the "Dragon") and a friend of all pilots, who has the isolated job of wireless operator at the fort. 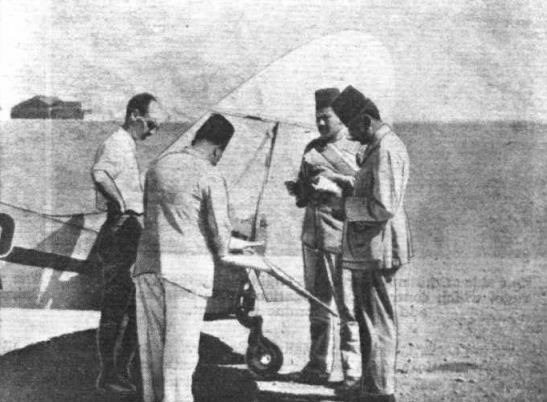 J. K. Morton, the "Dragon's" pilot, satisfying the Egyptian customs officials at Mersa Matruh. Clouds - an impression from the "Dragon's" cabin windows. 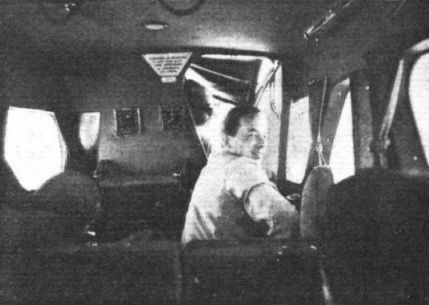 The pilot, Mr. J. K. Morton, looking back in the cabin towards Mr. Graham Mackinnon. 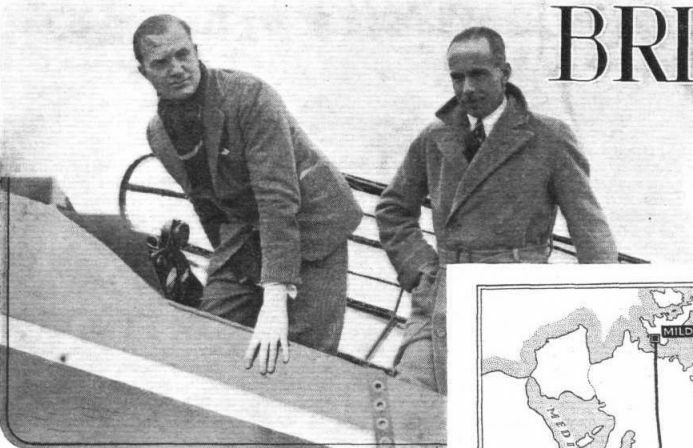 WINGED WORDS: Hengist, her Civil Air Ensign and Air Mail Pennant fluttering, prepares to take off from Croydon with the first Australian Air Mail. 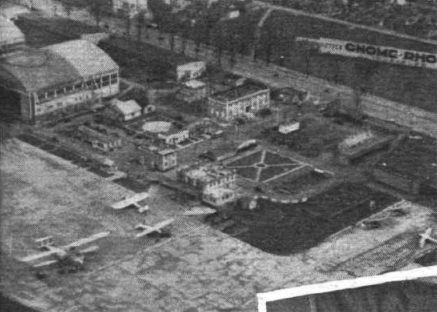 Le Bourget from the air; an Imperial Airways H.P.42 can be seen on the tarmac. 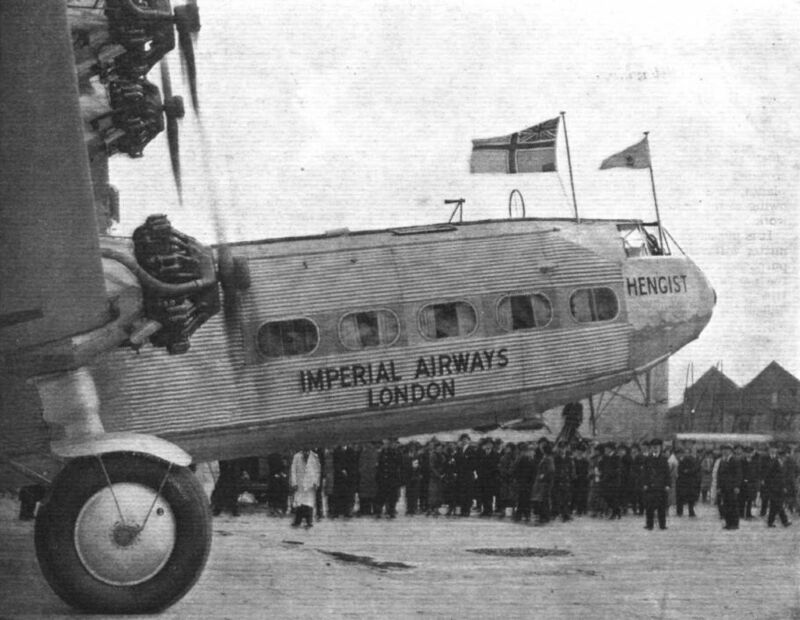 Imperial Airways H.P. 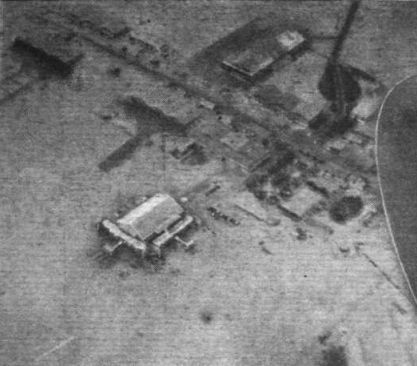 42's, too large for the Heliopolis aerodrome hangars at Cairo, produce "Mother and little pigs" effect. ITALIAN EQUIPMENT FOR S.A.B.E.N.A. 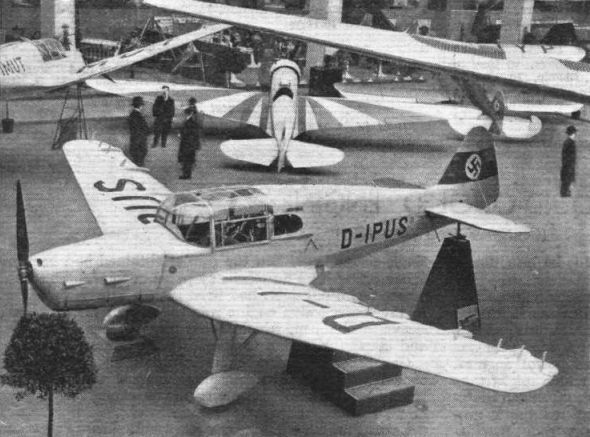 Three Savoia Marchetti S.73 eighteen-passenger monoplanes of the type shown here, fitted with 600 h.p. 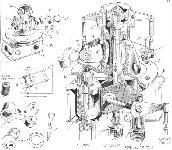 Gnome Rhone K.g engines, will soon augment S.A.B.E.N.A. 's fleet. The machines' cruising speed is 167 m.p.h. and the maximum speed 202 m.p.h. MAILS TO THE CONGO: The modified (and renamed) "Comet" ready for Mr. Ken Waller and M. Franchomme to carry the Christmas mails to the Congo. With the rear tank removed and with a mail compartment and a smaller tank in the nose, the machine still has a safe range of 2,000 miles carrying 200-250 lbs. of mail matter. The "Reine Astrid" left Brussels last Thursday. SLIPPERS : The "Envoy's" equipment. VICEREGAL: The Star of India, an Avro 642 (four "Lynx IVc") for the Viceroy of India. It travels over 600 miles at 130 m.p.h., with six passengers and four crew. The seating and interior decoration are particularly luxurious. AMERICA'S NEWEST: The Martin flying boat ordered for a proposed Trans-Pacific service of Pan American Airways. 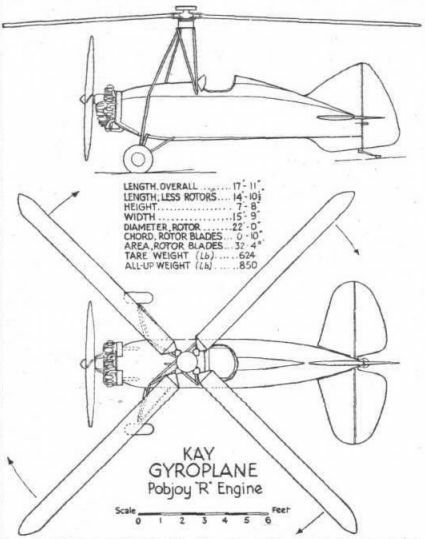 Note the sponsons for lateral stability on the water, and the cowling and placing of the 800 h.p. 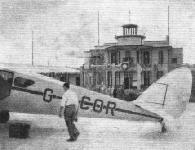 two-row radial engines. 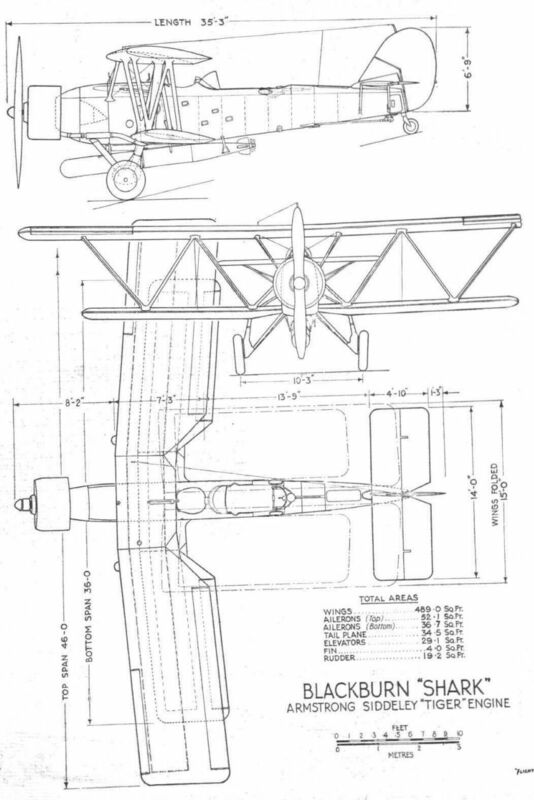 TWO-SEATER FIRE POWER - SINGLE-SEATER SPEED: The Consolidated P. 30 two-seater "pursuit" or fighter monoplane believed to be the type ordered by the U.S. Army Air Corps as stated on this page. Fitted with a twelve cylinder Curtiss "Conqueror" of 650 h.p., equipped with an exhaust-driven supercharger, the top speed is about 250 m.p.h. - faster than most single seaters. 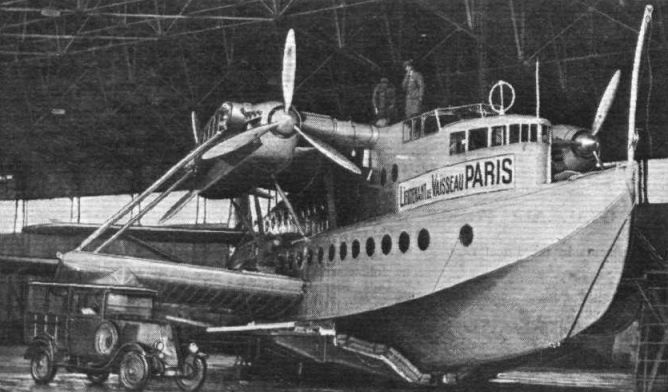 The Fieseler four-seater built for the Challenge de Tourisme; large Fowler flaps are an interesting feature. NEARING COMPLETION: The giant Latecoere boat Lieutenant de Vaisseau Paris, designed for the South Atlantic crossing, in course of erection at Biscarosse. A maximum speed of 155 m.p.h. and a useful range of about 2,800 miles are expected. The engines are Hispanos and the maximum permissible all-up weight will be 81,570 lb. with an actual payload of 26,000 lb. 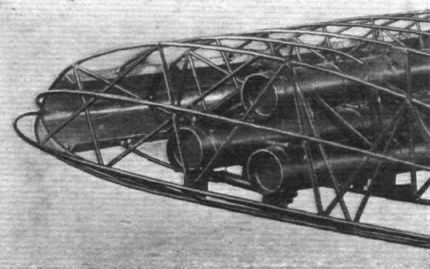 A three-quarter front view of the "MB1" in skeleton. Note the sharp "vee" of the windscreen. 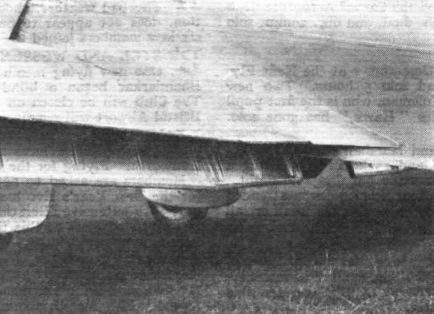 A closer view of the "MB1" taken from behind, with the flap raised ready for folding the wing. How the wing is released for folding: the front pin is of the screw type, and is withdrawn by rotating the small handle. 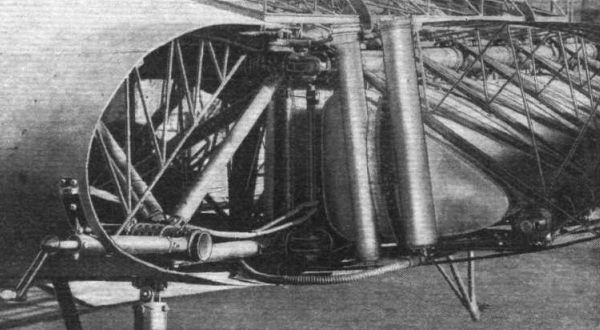 The wing spar consists of three large-diameter but thin-gauge booms, braced by smaller tubes, and converging towards one another at the other extremity. 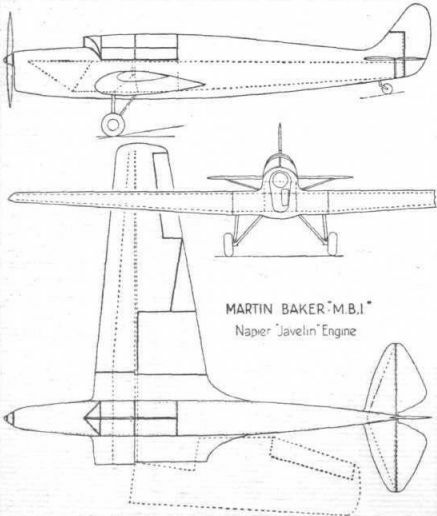 A set of sketches showing the chief points of interest in the wing spar. The details on the left are of the main strut attachment and on the right of the method by which the ribs are secured. The letters are a key to the details. 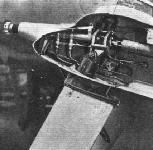 A section of the rear part of the fuselage, at which point the struts are secured in the same way as on the wing spar. At the bottom is one of the machined-fitting joints used in the front part of the fuselage. 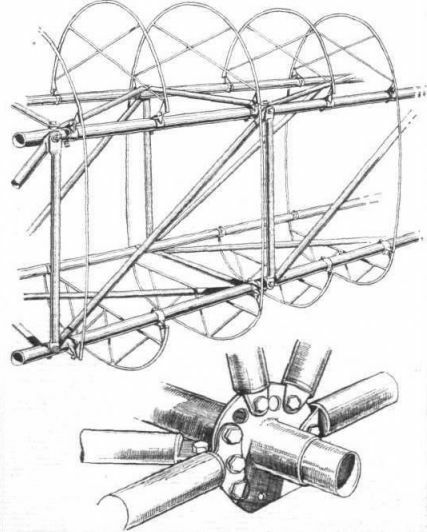 (Top) The upper of the two joints about which the wing folds; (below) the two halves of the locking arrangement on the front joint of the wing spar. The screwed pin is worked by a small handle. "The wings became self-warping, and I held the camera to my eye, waiting, waiting... until at last they gave up the ghost." TURRETED: The forward gunner of the big French Liore et Olivier 208 bomber is protected from a 200 m.p.h. 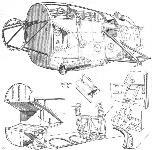 air-stream by this ingenious turret, which turns both in horizontal and vertical planes.